No. 10, Jalan Mahir 1, Taman Perindustrian Cemerlang, 81800 Ulu Tiram, Johor, Malaysia. Because of many choices exist in the marketplace; we are continually refining our organization to provide the level of service our clients have come to expect. From our headquarters in Johor, we frequently ship and install throughout Malaysia. We are committed to placing our customers first. Our business model delivers true value combining affordable, high quality display and storage solutions for any business backed by service excellence. We manufacture complete economical solutions in a variety of styles and designs. As one of the largest manufacturers of display and warehouse shelving systems we keep high levels of inventory for speedy dispatch locally, nationally and throughout Malaysia. Year 1999 - Incorporated in Malaysia and star operation at Taman Mount Austin. Year 2002 - Appointed by one of the largest racking manufacturing company by EONMETALL SYSTEMS SDN. BHD. 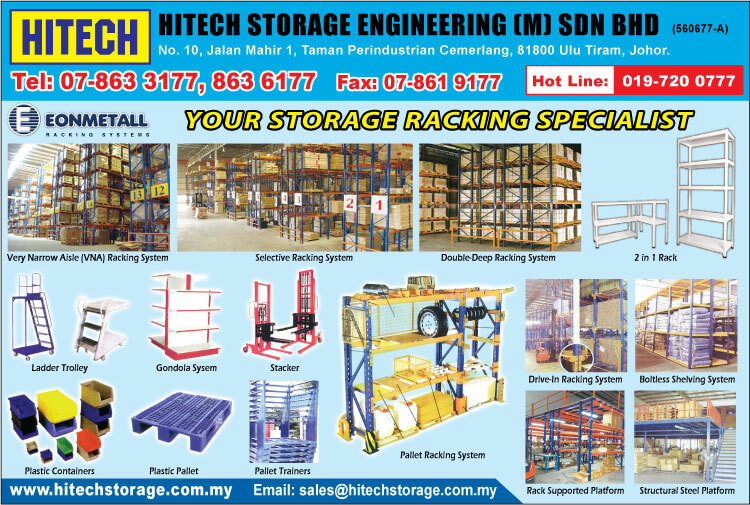 as their business partner to marketing storage in Southern Regions of Malaysia. Year 2006 - Shifted to own building at Taman Perindustrian Cemerlang with build-up area 4,800sqft. Year 2012 - Shifted to own building at Taman Perindustrian Cemerlang with build-up area 14,400sqft.